Every Manitoba Amphibex operator approaches the art of ice-breaking a little differently. Each has their own tricks for clawing the hefty amphibious machine onto river ice with its toothy excavator arm. Some are even particular about what music they have bumping inside the cozy wheelhouse as they crush and bob along. For Brian Sparks, one song complements the odd job like no other. “Give a Little Bit by Supertramp. You know, when you’re trying to break up the ice? Give a little bit,” he chuckles. Things have changed since Sparks’s first rip around the frozen Red River 13 years ago, when Manitoba’s Amphibex program got its start. By now many Manitobans are familiar with the sight of the insectile green machines — which look like a cross between a barge and a backhoe — and the trail of crushed ice they leave behind on the Red River every February and March. What most are likely less familiar with is the story of how the program came to be — and the amount of time, money and energy that’s invested from everyone involved. The province’s program aims to ease flooding along the north Red River by breaking up ice, preventing larger chunks from causing jams during the spring melt — which in turn back the river up and lead it to spill its banks as it flows toward Lake Winnipeg. It’s a program that has expanded from one second-hand Amphibex — operated by an inexperienced motley crew of heavy machinery operators and off-season Coast Guard workers — to a fleet of four machines today, controlled by seasoned drivers who execute a carefully designed flood prevention plan. But before that team became so skilled, there were a couple of considerable hurdles. First, Amphibexes aren’t even designed to do what they’re used for in Manitoba. 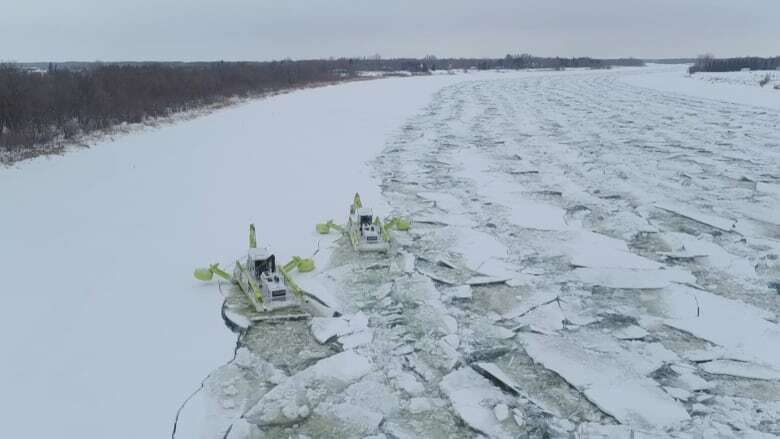 They were originally engineered for dredging waterways in the summer, so Manitoba crews learned they had to be beef up the machines to withstand high-impact ice-breaking. There was also a sharp learning curve for operators early on. “There’s no instruction manual for what we do,” said Darrell Kupchik, executive director of the North Red Waterway Maintenance Corporation. The North Red Waterway Maintenance Corporation was formed in answer to ice-jam flooding on the Red north of Winnipeg, which affected the city of Selkirk and the rural municipalities of St. Andrews and St. Clements. 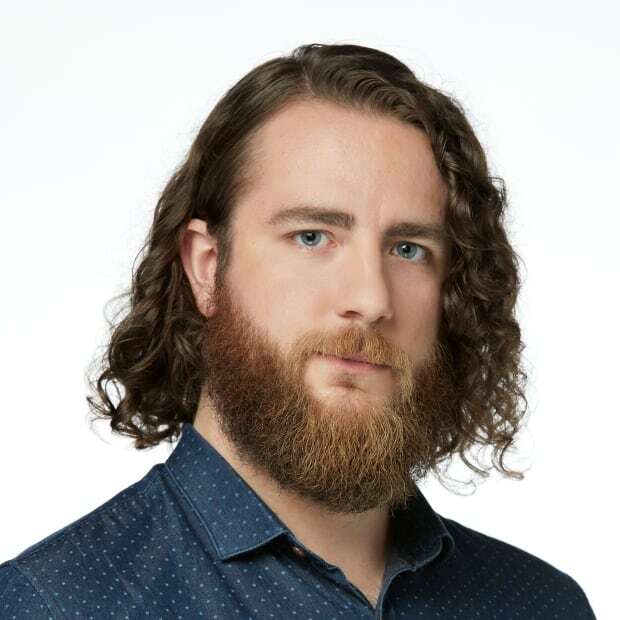 “We’ve got worldwide attention for what we do here and this is, like, truly a made-in-Manitoba solution to a recurring problem,” said Kupchik. 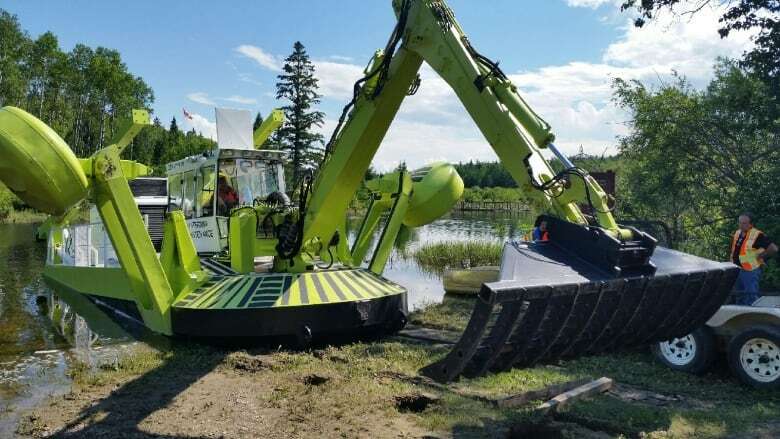 He estimates the cost of running the program will be in the range of $1.5 million this year, a big bump from the $65,600 allotted in the inaugural year — 2006, when the group of three municipalities north of Winnipeg purchased their first Amphibex, together with the province. The Manitoba government now owns most of the province’s Amphibexes, and contracts out ice-breaking work to North Red. A provincial spokesperson said ice thickness, and the effort that goes into crushing it up, changes year to year, and that also accounts for the variation in annual funding commitments. Brand new, an Amphibex goes for about $1.2 million, said Kupchik. That first used machine came from a company that had limited success with icebreaking in Quebec. Kupchik said North Red broke a little bit of ice, and a lot of Amphibex parts, in 2006. The group began to dream about the impact a second Amphibex would have on operations. In 2007, North Red rented a second machine from a company out east that transported the 22,000-kilogram beast, and a crew, to Manitoba. Things went marginally better, said Kupchik, so the province shelled out for a second Amphibex the following ice-breaking season. The company retired its original machine and acquired more over the next few years as its overall approach evolved. There are currently four in the provincial arsenal: three are owned by the Manitoba government, and one is owned by North Red. Today, one of the first stages is to send crew members out on the Red near Selkirk to post warnings and give ice fishers a deadline to get their shacks off the river. 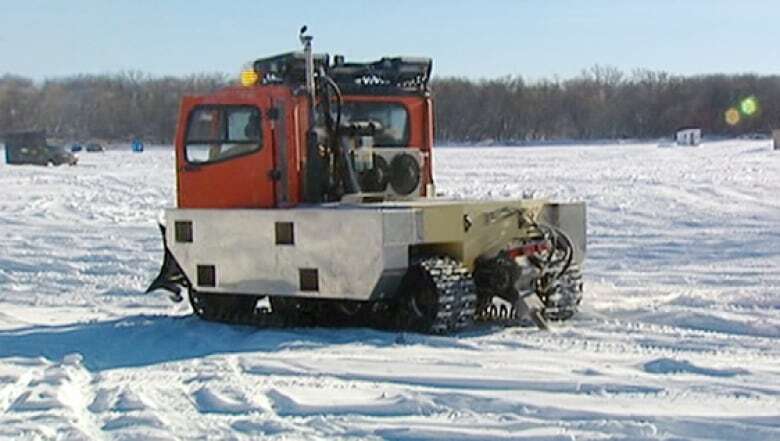 A second step is to drive around the ice in Argos — another odd vehicle that looks like a tiny tank — with ground-penetrating radar to map and measure the thickness of the river. Radar data informs the third stage: ice cutting. Despite having roughly the weight of a Greyhound bus full of passengers and luggage, an Amphibex isn’t heavy enough to shatter Red River ice on its own. Average ice depth on the Red reached just shy of a metre (over three feet) this winter, said Kupchik. Amphibexes are designed to crush through less than half that — about 45 centimetres — unaided, he said. So in order to ensure the Amphibexes do the trick, the team first sends out the saws. North Red has a skid-steer platform equipped with a heavy duty saw capable of cutting right through the ice. It’s run via remote control, Kupchik said, by an operator who is seated in an Argo about 30 metres away from the cuts for safety reasons. Once the cuts are done, it’s time for the real action. The Amphibexes are trucked to sites on the Red. Ideally there’s enough snow on riverbanks and other launch sites for them to slide downhill toward the ice’s edge. If those conditions aren’t met, the bizarre-looking machines can start to look even more bizarre. The Amphibexes have no real propulsion system in the winter, apart from the excavator arm that reaches out from the front of the machine and drags it along the ice. On shore, it can use that arm to slowly, slowly edge closer to the ice — like a one-armed bug dragging itself forward. It’s aided by spuds — long telescoping poles typically used for anchoring the machine to the bottom of a lake or river during summer dredging activities, but which are used in winter to help the Amphibex inch up to the ice at a snail’s pace, said Kupchik. Once they’re on the ice, the machines follow the cut lines left by the saws, up and down the Red, where — pulled forward by the arm — their weight breaks apart the cut ice. The team sets up and tears down a base camp as it slowly moves from site to site along the river over the roughly six-week ice-breaking season. At the end of each 12-hour day shift, new operators take over and carry on breaking through the night. Someone like Sparks may work 20 to 30 days over the course of the season and pull in about $450 per shift, he said. Things occasionally don’t go as planned: pins pop, excavator arms jam, all sorts of sensitive hydraulic components may break. When things go wrong, the machines are rendered motionless on the semi-broken ice until a mechanic can be ferried out to fix the problem right there. “It’s a learning curve and it takes an operator years to really become proficient,” said Kupchik. Operator Brian Sparks knows that all too well. He’s honed the craft of Amphibex maneuvering over the past 14 seasons, but it wasn’t always so easy. He remembers getting scouted to join the project in 2006. Then an employee of the Coast Guard, as he still is, the 66-year-old Selkirk resident was asked to try his hand at Amphibexing. He accepted the curious invitation. It might seem like after all these springs bobbing around breaking river ice, he’d be bored out there. “The boring part goes away because every time you move the Amphibex, it’s sort of like a fingerprint — there’s no two the same,” he said. Manitoba flood experts predict the Red River Valley could be in store this year for a flood comparable to, or worse than, the 2009 flood — which caused thousands of evacuations and $70-million in damage. 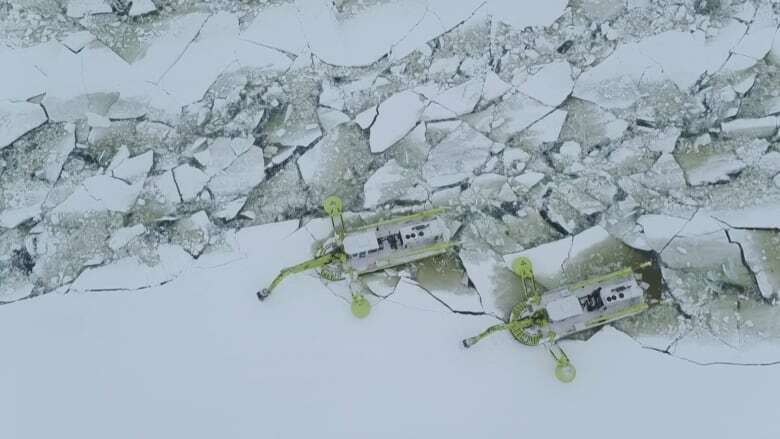 Much of that was the result of severe ice jamming north of Winnipeg at Breezy Point and St. Clements, which forced full-scale evacuations, Environment and Climate Change Canada notes. South of Winnipeg, about 1½ Olympic-size swimming pools worth of water flowed along the Red every second that year. In hopes of easing the damage this year, the province kicked the Amphibex program into gear on Feb. 25, and its season is now winding down. One of the machines was out working the Fisher River, another was on the Icelandic River in Riverton and a third was breaking up ice on the Brokenhead last week. The Amphibexes will head out for their final runs of the year this week at the Portage Diversion in Portage la Prairie. Staring down the possibility of another flood like 2009’s could make the average Amphibex operator a little anxious, but Sparks seems to handle the pressure fine. “What we can’t control is the amount of water that’s coming,” he said.